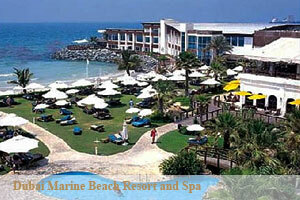 Featuring a private beach front, Dubai Marine Beach Resort has 3 swimming pools and offers fine al-fresco dining. It offers modern accommodation and a wide range of sports activities. The Dubai Marine Resort & Spa has tennis courts, a spa and a gym offering aerobic and spinning classes. There is also separate swimming pool for children. There are 13 themed food and beverage options in total. Guests can enjoy a wide variety of cuisines including Arabian, Lebanese, Italian and Thai. Over a dozen award-winning night clubs are also on site. The rooms have warm, bright colours and come with flat-screen TVs and free Wi-Fi. Guests can make use of the free soap and shampoo products. Some rooms have sea-view balconies. The hotel provides a shuttle service to some of the city’s most exclusive malls. The hotel is a 10 minutes' drive from Burj Khalifa and 12 km from Dubai International Airport. Located at the beginning of Jumeirah Beach Road, the Resort is only 10 minutes drive from the City and World Trade Centre, in close proximity of Major Shopping Malls and 15 minutes from the International Airport.